17 years ago today, on October 25, 1998, I was in the Port of Omoa, visiting clients and looking to collect money from adds in the Honduras tips magazine, which I owned and managed back then. The weather was unsettled, with torrential rains coming down on a regular basis. My first stop was at the Acantilados del Caribe Hotel, where I stopped briefly and had a chance to chat with Gustavo Enrique Ustariz (Tavoquike). He was the son of the owner, who had just returned to Honduras after studying tourism in the USA. His dream: to take on and grow the family business. He expressed concerns about Hurricane Mitch, which by then was already a major hurricane churning well off the coast of Nicaragua and heading North. The National Hurricane Center predicted that the storm would follow the coast of Honduras, about 100 miles North of the Bay Islands and would impact the Yucatan Peninsula, somewhere south of Cozumel Island. I was on a much more confident note, considering the forecast that the NHC, the “hurricane experts” where issuing! Personally I considered myself an expert with hurricanes. I had ridden out Hurricane Gilbert 10 years earlier in Cancun. The hurricane struck the Yucatan Peninsula just south of Cancun on September 13, 1988. After my chat with Tavoquike, I continued my tour to the town of Omoa. There, I stopped by to visit an old Swiss, who was an institution in town. Hehad a famous restaurant there called “El Botin del Suizo” which would translate into something like “The Swiss’ Bounty”. Ulrich, who has since passed away, was also concerned with the storm. After a short chat, and it being evident that with no clients in the beach side restaurant due to the heavy downpours, I was not going to make any collections, I went ahead and took advantage of a short break in the rain to get our baby, Juan Diego back in the car and continue our journey. I decided to make a last stop at the “Rio Coto” in Omoa restaurant. As I walked in, I was hurriedly welcome by Carlos Arita, the owner. He was extremely busy due to the fact that he had a full restaurant. 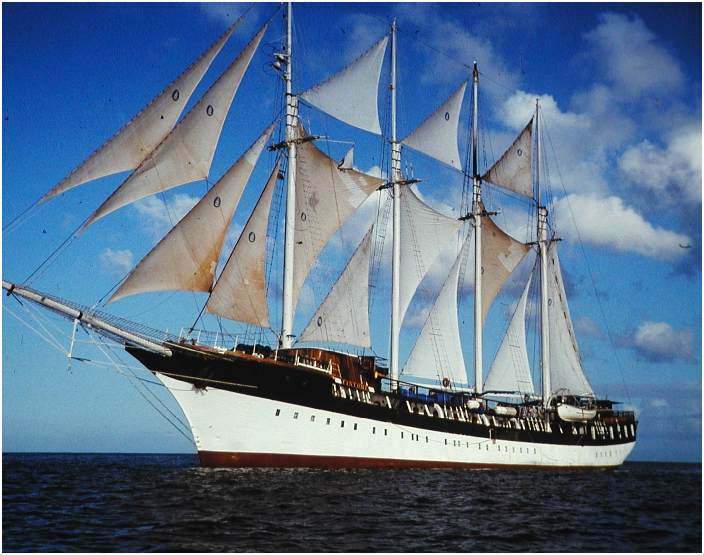 You see, the MV Fantome, a lovely four masted cruise ship owned by barefoot cruises was in port, and their operating base was the Rio Coto restaurant right on the bay. There were 80 somewhat cruise ship passengers waiting under the thatched palm roof of the restaurant for a break in the weather to be transferred out to the luxury yacht that was anchored in the Bay of Omoa. Carlos was indeed doing business, selling beer and drinks to all the cruise ship passengers. Meanwhile, the passengers were getting antsy to board the vessel. It was clear that Carlos’ priority was to take care of business, not settle bills.